Still life: fresh hops and fresh beer on a wooden pallet. Is the glass half empty or half full? For my friends, family, and all of my readers: Wishing it to be the latter in 2012. In case you hadn't surmised: "Laimingų Naujųju Metųu," translated into English, means "Happy New Year." The language is Lithuanian. Pic(k) of the Week: one in a weekly series of personal photos, often posted on Saturdays, and often, but not always, with a good fermentable as a subject. Commercial use requires explicit permission, as per Creative Commons. Not a list of the dozen best-of-the-best books about beer of 2011, but, rather, my list of 12, some personal delights, others of unique or deserved merit. Some of the books have been published this year, while others are worthy chestnuts. I was planning to reveal my selections between 20 November and the Winter Solstice New Year's Eve. Now, I'll be posting my final choices in the new year. Delayed, but still valid. So ... cue Five Go-old Rings. For Cool Yule beer book suggestion #5 (a), I reached out for fellow Virginia beer blogger Eric Delia, who reviewed the book, Richmond Beers. Staying regional, Brewing in Baltimore is a bookend to that. He saw what others saw but in different colors. . . . He had a historian’s consciousness of the past, which gave him a visionary’s perspective on the future.” That is as good as any description of an historian. Author of Brewing in Baltimore, Maureen O'Prey is indeed an historian. She holds a Masters in Historical Studies from the University of Maryland, and is a professor of history at Baltimore City Community College, Maryland. And, she loves a good beer. Ms. O'Prey began her research with Brewing in Maryland, a self-published book in the mid-1960s by William J. Kelley, a local beer aficionado and amateur historian. Then, serendipitously, Catherine Scott, the archivist of the Baltimore Museum of Industry alerted her to a treasure trove: original documents dating from the late 19th century of Baltimore Gas & Electric, then known as Consolidated Gas & Electric. Why would this be crucial? Because the breweries were among the first industries to switch from producing their own electricity with coal-fired generators to purchasing power. And Consolidated kept detailed records. Addresses, names, brewers, officers, equipment, production, energy requirements, photographs, etc. From there, she found leather-bound ledgers for early 20th century breweries and one mini-conglomerate in Maryland. The latter failed, in part, because of local consumer antipathy. After repeal in the early 1930s, there were 75 breweries in Maryland; by the late 1980s only one, and that one just outside of Baltimore City. Support for local breweries had become severely diminished. O'Prey lists the names and tells the stories in the roll of the departed Baltimore breweries: such as Maryland Brewing Company, Gottlieb, Free State, Bauerenschmidt, Globe, Arrow, American, and, of course, National (Natty Boh, hon!). She tells us that the company which almost single-handedly invented bottle enclosures as we know them today —Crown, Cork, and Seal— was a Baltimore company. Ms. O'Prey has discovered another truly fascinating resource. As Prohibition would loom in the 1910s, the United States Brewers Association published several Anti-Prohibition Manuals. These snapshots into society at the time compared, for example, the relative lesser crime rate in a 'wet' state such as Maryland versus a dry state such as Kansas. Prohibition-backers, such as the Anti-Saloon League, would constantly tout the nirvana that would be achieved if alcohol were banned. These published statistics showed otherwise. Not enough folk listened: a cautionary tale in the face of today's neo-Prohibitionism? There are no brewery recipes in the book. Ms. O'Prey laments that these may be permanently missing, or may require greater sleuthing to be unearthed. In the UK, brewing historians such as Ron Pattinson and Martyn Cornell have done yeoman work in doing just that. Like a zymurgic Jurassic Park, the recipes they are uncovering literally can be used to bring the efforts of those long-lost breweries back to life. The publisher of Brewing in Baltimore is Arcadia, South Carolina-based. Its series Images of America consists of pictorial books of American history. The books re all exactly 128 pages, the areas they cover must only be cities or small regions or jurisdictions, and oddly enough, no footnotes or endnotes are permitted. Thus, Ms. O'Prey was limited to only Baltimore, and to a pre-determined format. Despite the marvelous photographs on almost every page of Brewing in Baltimore, the life of the breweries is sometimes subsumed by the litany of names. Arcadia limits documentation to a bibliography. The format also denies room for more analysis into the reasons for success and ultimate failure. That WWII soldiers —who had been supplied weaker beers made possible by improving technologies such as canning— may have desired those less flavorful beers when they returned from the war-font is insufficient to hang a theory of the demise of smaller breweries making more flavorful beer. Brewing in Baltimore is an entertaining and visually fascinating introduction to the rise, and crash, and re-birth of brewing in the city. It's a valuable lesson on what happened there (and elsewhere) and what could happen again, whether via neo-Prohibition or through neglect of local community support in the battle against larger, outside concerns. The colorful history of brewing in Baltimore serves as both a reminder of the city's strong heritage and a testament to the craft brewing industry's ability to persevere with local support [emphasis mine], despite the odds. Ms. O'Prey has plans to write a much more exhaustive history of brewing, not just of Baltimore, but of the entire state of Maryland: the full story of Maryland's breweries and brewers, their beers and recipes, and their economic and societal impact and legacy. With a historian's pride, she grins: "There'll be extensive footnotes!" Maureen O'Prey will be signing copies of Brewing in Baltimore at Heavy Seas Brewing Company on Saturday, 17 January, between 11am and 5pm. Hugh Sisson will also be present for signing. Registration is required: here. Follow more about the book on Twitter: @BrewBalt. 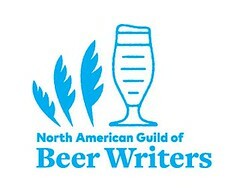 For on-line purchasing, I link to the Brewers Association book store, or to the marvelous resource, BeerBooks.com. When not available there, or if published as an ebook, I link to Amazon.com. Part 2: "What we can learn from the wine expert’s perspective on Craft Beer." 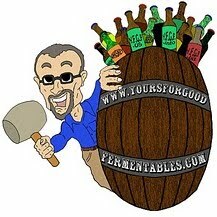 A couple of weeks ago, Nick Anderson —The Beermonger— guest-hosted here at YFGF. His piece —"What we can learn from the wine expert’s perspective on Craft Beer. "— was a review of Wine Enthusiast Magazine's list of Top 25 Beers for 2011. The post elicited a surfeit of hits; it was selected by DCBeer.com as one of that blog's favorite beer blog posts for 2011; and it engendered an interesting give-and-take on Facebook between Anderson and Paul Hill, the On-Premise and Specialty Retail Sales Manager at Select Wines Inc, a wine and beer wholesaler in northern Virginia. I've copied the entire exchange, below, with permission. Lists are inherently non-inclusive. The utility of a list will be directly related to its sample size, but, regardless of data, many beers, a priori, will have been left untasted or unmentioned. The omission of brewpub beers on most beer lists. To review them would be Sisyphean: there are many, and there are many that open and close, seemingly weekly. The omission of brewpub beer —a non-trivial portion of the beer produced in the U.S.— leaves truly fresh beer prejudicially unheralded. Not all wine geeks disdain good beer; not all beer geeks are ignorant of good wine. Follow the link at the end of the discussion to a different selection of the 50 Best Beers: a 'geekier' list, as Hill points out. There's plenty of us out there who can appreciate the"balance" or cleanness of a Montrachet as well as the wild character of a geueze. The only problem with brett is when its where it shouldn't be. If its not appropriate for the style...its a distraction and a flaw. Thats as true for a pils as it is for a pinot grigio. Admittedly I don't know of any wines where its appropriate, but I've had wineries who almost embrace their"infections" a house character...of course I hated the wines. Another thing about the list. The WS Top 100 list is out of usually 6 to 8 THOUSAND wines they tasted. This top 25 is out of the 131 beers they reviewed for the year. I'm pretty sure we've all had more than that this year. So, I thought it was a reasonable list considering only 31 non US beers had the possibility of making the list, and obviously not only hundreds of breweries were excluded, but multiple states had no representation in their sample pool. Ya kind of have to take the list with a grain of salt when that means at least almost 20% of the beers they tried scored 92+. Maybe they only tasted 4 sour beers on the year. Whatever...beer geeks, and wine snobs...we all know lists if any kind only exist so we point out their flaws. Good points. I was admittedly painting with a broad brush with the macro thing, but it's something I've noticed over the years. A LOT of wine people drink nothing but Miller Lite, Corona, etc when they turn to beer. Those folks tend to be the ones who're the most sensitive to brett so that's where I went. Also: I really liked the WE Top 25 which is why I commented on it in the first place. I too wish we'd hear more about the yeast strains used in winemaking. Maybe it's just the beer geek in me, but I'm awfully curious about who uses what and what characteristics which strains may impart. True, but I've always been amazed when dealing with winemakers and brewers around the world, that after they leave work...more often than not the wine makers want to go out and drink a beer(beer geeky beers), and the brewers very often talk more passionately about the wines they have cellared at home. I guess that can be chalked up to"one is work, one is fun". But its all about taste sensations regardless of where it comes from. Maybe all the BG's and WS's dancing around your hippy campfire should just be called flavor junkies! Yeah, I think so. The whole difference between people into beer and wine is choice of beverage; in the end we're all looking for something interesting. Just looked at the list again. To show how small a sample we're dealing with here. Saw that allagash triple was#10. Love the beer, but allagash is definitely in the upper echelon of us brewers that embrace brett, oak, and are blurring the line between wine and beer. Why weren't any of their other beers on the list? The allagash black was#1 last year. Oh, because they only tasted one beer from Maine this year. True, but it's not Beer Enthusiast magazine. Another aspect of the list I found interesting was seeing what they picked out to feature to their (primarily) wine-centric readership from the relatively small sample of beers sampled. What about this list? The Fifty Best Beers: Guide to the world's best beers. Definitely raises the "beer geek" factor. That's a pretty damn good list right there. Caveat lector: I am employed by Select Wines, Inc.
Not a list of the dozen best-of-the-best books about beer of 2011, but, rather, my list of 12, some personal delights, others of unique or deserved merit. Some of the books have been published this year, while others are worthy chestnuts. I'll reveal my selections between 20 November and the Winter Solstice New Year. For the beer book suggestion at #5, I reached out for fellow Virginia beer blogger Eric Delia. He may write at Relentless Thirst, based in Richmond, Virginia, but he often addresses beer 'issues' of well beyond those borders. In this case, Eric stayed 'in-town', reviewing a book on the history of Richmond Beers while offering reasons as to why even such a regional history has further import. I've labelled the review as #5(a), because I'll be reviewing another regional history —Brewing in Baltimore. Thank you Eric (and be sure to read his blog)! At first glance, Richmond Beers may seem like just an extensive collection of breweriana, a tangible vault of bottles, cans, and labels that have been archived in print. Even still, those labels and advertisements can say a lot about the brewing industry through the years. Despite the sometimes unwieldy statistics and timelines that Danny Morris and Jeff Johnson were tasked with putting into written word, the book offers more than just old images on new pages. It provides an insight into Richmond's not-so famous brewing past. What many may not realize is the impact that immigrants from Germany had on Central Virginia, giving the River City a decidedly Teutonic trait. With names like Rosenegk, Yuengling, Stumpf, Bergner & Engel, even the mighty Anheuser Busch, Richmond was an early East Coast outpost for brewing based in the German tradition. Not only that, but the interconnectedness of markets becomes evident as brewing giants from Philadelphia tried their hands at satellite breweries and bottling companies in the South. One prominent example is the James River Steam Brewery, opened by none other than Pottsville's own D.G. Yuengling, Jr. with partners from Philadelphia. Another is the introduction of canned beer in the United States by the Krueger Brewing Company of Newark, New Jersey, which first occurred in, you guessed it, the Richmond market. Outside influence in Richmond was not taken lightly by resident brewers, which led to the formation of the Home Brewing Company. The brewery selected its name not as encouragement for locals to start homebrewing, but to distinguish itself from breweries that came from "away." It was essentially advertising itself as the local brewery in town with emphasis placed on its Richbrau beer, and through several incarnations over the years it lived on as the Richbrau Brewing Company, which ultimately closed its doors in February 2010. As Morris and Johnson dole out the straight facts, the reader can get a feel for the expansion and contraction of the brewing industry in Richmond as it follows the contours of depression and boom times, then is effectively killed by Prohibition only to be resurrected in the years after the Noble Experiment ended. The authors have compiled records from the distant past to the recent past, highlighting the long history of brewing in Richmond. And they included a lot of visually stunning images to help tell the tale. I'm not going to lie -if you're not a collector of breweriana, a beer historian, or someone mildly into beer facts- Richmond Beers may not be for you. But, if you've got the slightest interest to take a glimpse into the world of a mid-sized American city and its brewing legacy, it's worth it to take a look. Eric Delia has compiled a comprehensive listing of breweries and brewpubs in Virginia at his site: here. Follow him on Twitter: @relentlssthirst (without an e between 'l' and 's'). So ... cue six geese-a-laying. The Busch family was dysfunctional: from shootings to philandering to poor decisions making to losing the family jewels. All of us —consumers, distributors, competitors —believed that these guys were on top of the beer world. For quite a while their company, Anheuser-Busch, was indeed. But now, they aren't, and it isn't. From humble beginnings in the mid-19th century, Anheuser-Busch built itself into an American totem, as American as 'apple pie.' How could America itself, to stretch the point, be sold? But it was, and to a foreign conglomerate, InBev, itself cribbed together from smaller breweries in South America and Europe. preferred wine to his own beer, which, according to one published account, he called "dot schlop." Under the Influence ends with the stewardship of August Busch III, who in the 1970s into the early 1990s, achieved the dream of controlling the majority of U.S. beer sales. Anheuser-Busch achieved a 52% market share. That was its pinnacle. The loss of independence would come rapidly. Since its release in 1991, this New York Times Best Seller has become increasingly popular among beer enthusiasts, and has become very difficult to find as it has gone out of print despite ongoing demand. But if you can find it, it's a valuable read. At a recent seminar on the state of the craft beer business in Washington, D.C., one person asked the panel why the American mainstream breweries became non-viable, and then, with Anheuser-Busch's sale in 2008, lost any American ownership. There were the usual tropes offered: lack of flavor, lack of quality, etc. The questioner was dissatisfied, and persisted with a followup question. "But if they had been so successful, why did they fail?" Find some of the answers, in this book. Midwestern breweries, such as Anheuser-Busch, eventually eclipsed the larger East Coast breweries, because, in part, the Midwesterners were forced to ship greater distances and open more breweries. Population was concentrated in the large cities on the East Coast; breweries there did not have to be as aggressive for a customer base. Anheuser-Busch just was more ruthless in its marketing and sales than its competitors ... and luckier. The level of family dysfunction, of profligacy, of seemingly arbitrary decisions at home and work is a shock to read about and often flies in the face of the company's ruthless success. But Anheuser-Busch did manage to market itself amazingly well. The brewery became the beer brand of America. Budweiser was an icon of he nation recognized throughout the world. As to the quality of the beer, so often derided by 'craft' beer makers and drinkers? The science and technology of modern breweries was developed by the large breweries, and especially so, after Prohibition, when under-capitalized breweries couldn't keep up. To deny the quality of the mainstream breweries —whether one likes the flavor (or lack thereof) or not— disregards the technology and business of beer. And small breweries today ignore quality control and sales to their peril. 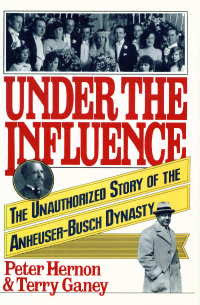 For the story afterward —the seemingly doomed leadership of August Busch IV and the consequent buy-out of the brewery by InBev, a Belgian-Brazilian conglomerate, in 2008— read Dethroning the King: The Hostile Takeover of Anheuser-Busch, an American Icon, by Julie McIntosh, a reporter for the Financial Times. It's available from BeerBooks.com and as a Kindle eBook. The sale of AB occured during a perfect storm of business circumstance. In 2008, the financial situation in the U.S. had begun to seriously crash, but the contagion had not spread completely: InBev was able to secure the 50 billion plus dollars in financing it needed. Despite controlling 52% of all beer sold in the U.S., Anheuser-Busch was experiencing declining sales by 2008. The real growth was in foreign beer markets, and in the U.S., craft beer, although that, at 5% of the market, was small beer, so to speak. The company had just begun to conduct serious cost-cutting and to investigate foreign mergers and acquisitions, but it was too little too late. There are two real shockers to this story. The Busch family only owned 3% of the shares. Thus, when InBev tendered its offer of $65 per share, CEO Auggie Busch IV and his retired father could not put up a stock fight. The second shock is that A-B had actually devised a plan to remain independent. A-B owned 50% of Modelo in Mexico. They offered to purchase the remaining 50% of the stock with A-B stock, and install Carlos Fenandez Gonzales, CEO of Modelo, as the new CEO of a re-christened Anheuser-Busch Modelo, headquartered in St. Louis. August Busch IV wold have been forced out, although still on the board. But ... AB's board rejected the plan, even after asking for it, and even after the closely-held Modelo board had agreed to it. Ms. Martin's implication is that the fix was in. Some anonymous sources suggest that several AB board members privately signalled to Carlos Brito of InBev that $70 per share would cinch the deal. InBev quickly agreed, and Anheuser-busch was American owned no more. InBev recognized the power of the Budweiser brand name however. It attached the name to the new company —Anheuser-Busch Inbev— and kept brewing operations and headquarters in St. Louis (even though some offices and managerial positions were moved to New York City. The book concludes with Auggie Busch IV's sad personal decline after the sale. None of the former great names of American brewing exist as brewing entities or as American-owned breweries. Coors is owned by Molson. Miller is owned by South African Breweries. Pabst is a marketing company, most of tis beers brewed by SAB/Miller. There is no more Schlitz, Shaefer, Stroh's, National Brewing. And, as of 2008, Anheuser-Busch InBev was (and still is) the world's largest brewery. That means that Yuengling —the oldest brewery in the United States (1829) and still family owned— is now the largest American-owned brewery in the United States, or it's Boston Beer, the publicly-owned maker of Sam Adams. That depends on what stats you're looking at. The statistic on brewery ranking comes from the Beer Association: Top 50 Overall Brewing Overall Brewing Companies. At No.1 is Anheuser-Busch InBev, based in Belgium. No.2 is MilleCoors, a US-only cooperation between SABMiller, based in England, and Molson/Coors, based in Canada. Pabst is at #3. Not a list of the dozen best-of-the-best books about beer of 2011, but, rather, my list of 12, some personal delights, others of unique or deserved merit. Some of the books have been published this year, while others are worthy chestnuts. Between 20 November and the Winter Solstice, I'll reveal my selections. Then, on Christmas Day: put your feet up, pour yourself a good beer, and read a good book. Or, better yet: give a friend the gift of a beer and a book. December 22nd may be too late to arrange shipping by Christmas (unless available as an e-book), but it's time sufficient to pay a visit to your local brick and mortar —and book— store. So ... cue seven swans-a-swimming. My previous selection, The Best of American Beer & Food, was a cookbook. Cool Yule #7 is a recipe book as well ... of beers. His Craft Beer Institute was and is integral to education on real ale. From one of his "Perfect Pint" sessions in the 1990s, I still have a pencil packed away from an even earlier run of his for Chicago-land political office. That unsuccessful campaign was good beer's gain! Designing Great Beers is divided into two sections. The first is recipe formulation. This is not a how-to for brewing step-by-step. There are other books for that. But, even for beginners, these chapters will reveal the reasons why they are following those simpler steps and procedures. Daniels provides formaulae and charts for determining extract, water adjustment, hop bitterness, yeast attenuation, etc. I would wager that even professional 'craft' brewers have used these chapters for reference. There's one quite valuable formula that Daniels has created just for the book —the BU:GU. Technically, it's the ratio of bittering units of the hops used to the gravity units (the amount of fermentable sugar present before fermentation). In plain English, it's the perception of the bitterness of a beer. Simply because a beer contains a lot of hops doesn't mean it will taste bitter; just because a beer is not of high alcoholic strength doesn't mean it won't pack a hoppy punch. It's the perception of bitterness —the balance between malt and hops— that the BU:GU addresses. Great stuff, and useful for those reductive "How many IBUs?" conversations about beer. The second part of Designing Great Beers is about brewing to 'style.' Daniels' definition of 'beer style' is one of the better I've read. A beer style comes into being when several brewers, often in close geographic proximity to each other, create beers that share a similar set of distinctive traits. These traits include body, alcohol content, bitterness, color, and profile. In the end, the traits of a style incorporate the variation seen from brewer to brewer [emphasis mine] while still defining a formulation that is generally distinguishable from other styles of beer. Perhaps the most important function of style is beer flavor. <...> This shorthand is very useful for communication between brewers, retailers, and consumers. It allows brewers to tell others what they have brewed without long, drawn-out explanations. In today's milieu run amok of 140 or so 'styles,' it's quaintly refreshing (pun intended) to find only 14 chapters of styles. That the book was published in 1996 in very little way outdates its style information. Quite the contrary! Daniels started with published guidelines as a baseline, but rather than relying on them unquestioned, he researched actual historical commercial records and homebrew competitions, identifying and quantifing style parameters. Daniels' work predates and anticipates, by more than decade, much of the current style revisionism of such historians as Martyn Cornell and Ron Pattinson. As valuable as this book might be for brewers of avocation or profession, the wealth of information in Designing Great Beers will help anyone —even a non-brewer— appreciate the flavors in beer and more easily identify them. For a proto-brewer, Designing Great Beers can help provide a practical understanding of brewing; for a beer consumer, the skill involved. For all, it can provide an historical understanding of styles, and why and where they developed. By gaining an understanding of all of this, the reader will better enjoy the next well-made beer she brews or drinks. And the next. And, after reading, consider taking the next step, by becoming accredited as a Beer Cicerone. Anyone can call themselves an expert on beer. [Emphasis mine.] But when consumers want great beer they need help from a server who really knows beer flavors, styles and brands. They also want to buy from a place that understands proper storage and serving so the beer they drink will be of the highest quality. Too often great beer is harmed by improper service practices. The website is: www.cicerone.org. You can follow Ray Daniels on Twitter @Cicerone_org. Between 20 November and the Winter Solstice, I'll reveal my selections. Then, on Christmas Day: put your feet up, pour yourself a good beer, and read a good book. Or, better yet: give a friend the gift of a beer and a book. December 22nd may be too late to arrange shipping by Christmas (unless available as an e-book), but it's time sufficient to pay a visit to your local brick and mortar —and book— store. 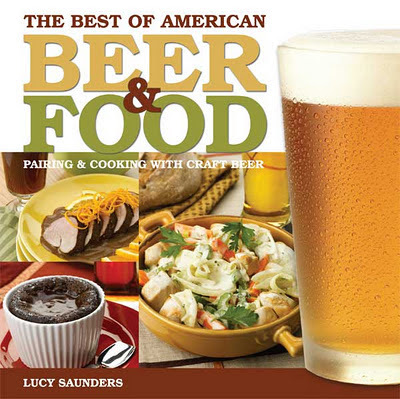 Lucy Saunders —the BeerCook— released The Best of American Beer & Food in 2007. It's just as fresh today. The book is divided into roughly two sections. The first reminds me of Real Beer And Good Eats by Bruce Aidells and Denis Kelly. Ms. Saunders interviews chefs, restaurant owners, and other beer celebrities. As well, Ms. Saunders writes several extended essays on beer styles, matching beer with food, on beer and cheese, and beer and chocolate). The second section features recipes from those chefs and celebrities, reminding me of a similar format in Cooking & Eating with Beer by Peter LaFrance. Some of the recipes include beer as an ingredient; others suggest appropriate pairings. Considering that many of these recipes come from brewpubs, those pairings make great sense: they have worked well and repeatedly. A partial listing of the folk featured includes Carol Stoudt, Diane Alexander, Lisa Morrison, Tom Peters, Garrett Oliver, Chuck Skypeck, Brewchef Tim Schafer, Larry Bell, Rob Tod, Natalie and Vinnie Cirluzo, Dan Gordon and Dean Biersch, Charles and Rose Ann Finkel, Jim Koch, Tomme Arthur, and Barton Seaver. Lucy gives props to some Washington, D.C. and Baltimore, Maryland, area restaurants (home to this blog): The Brewers Art, Brasserie Beck, Restaurant Nora, Birreria Paradiso, Rustico, R.F.D./Brickskeller, Tuscarora Mill, and Royal Mile Pub. There are two recipes from Diane Alexander of R.F.D., including Chicken and Artichoke Hearts in Anchor Steam Beer. Chef Patrick Dinh of Tuscarora Mill contributed his Asiago Soup with Smoked Ham. Royal Mile Pub's past owner/chef Ian Morrison provided his recipe for Lemon Thai Basil Sorbet. Saunders offers a recipe from Chef Barton Seaver, well known for his work for sustainable seafood. It's not seafood, but Grilled Lamb Top Round Steaks with Caramelized Tomato Risotto, which he prepared for a Clipper City Beer Dinner several years ago when he was chef at Washington, D.C.'s Cafe Saint-Ex. When the book was first released, some reviewers complained about the complexity of the recipes. These aren't as simple as bratwurst boiled in beer, one seemed to grouse. Yes, that's true. The Best of American Food & Beer is not a cookbook about technique. It's about, what else, beer with food, and about beer in food. But too complicated? If one is even a fair at-home-kitchen cook, most of the recipes are well within that skill set. Take this one, for example, which Ms. Saunders prepared for a Washington, D.C. morning news broadcast. Chef Bruce Paton of the Cathedral Hill Hotel, San Francisco, CA, pairs this warm creamy pasta salad with the Twist of Fate Bitter from Moonlight Brewing of Santa Rosa, CA. You could pair it with your favorite ESB. The Best of American Beer & Food is a special and usable cookbook, very usable: I've prepared several of the recipes. But therein lies its only demerit. The binding for this 'hard' paperback is not good: it falls apart after only a few uses. I hope that Brewers Publications releases a second edition in better condition. Ms. Saunders maintains a website at beercook.com (with links to her other cookbooks: Cooking With Beer and Grilling with Beer. Follow her on Twitter @LucyBeerCook. And, cook with this book! This review has been plagiarized. I admit it. I've cribbed it from ... MY earlier review, written in 2007, when the book was first released. At Oliver Breweries at the Pratt Street Alehouse, in downtown Baltimore, Maryland, the beer is fermented in open vats. Viable yeast is skimmed from the uppermost, spumous, layer of the fermenting beer —called kräusen (pronounced KROY [like boy] zen) —and used to ferment the next batch of beer. Here, the fermentation, although still quite active, has already passed the most active stage of fermentation called high kräusen. Notice the yeast and protein crust on the side walls of the fermenter, above the active yeast layer. Open fermentation is traditional method of fermentation, unlike the current practice of almost all breweries in the U.S. —and worldwide— of fermenting beers in closed vessels, and collecting the yeast after fermentation in cone-shaped sections at the bottom of the fermenters. Commercial reproduction requires explicit permission, as per Creative Commons. For non-commercial purposes, no permission is required (but kindly link back). Caveat lector: As a representative for Select Wines, Inc. —a wine and beer wholesaler in northern Virginia— I sell the beers of Oliver Ales. Clamps & Gaskets: News Roundup for Weeks 48/49, 2011. Flies are genetically predisposed to the taste of glycerol in beer, scientific study determines. Via Science News. A U.S. District Court judge in Portland, Oregon, rules that bloggers are not protected -as are journalists- by 1st Amendment 'shield' laws. Via cnet. Mick Jagger and Keith Richards to pay for blues great Hubert Sumlin's funeral. Via Rolling Stone. More about Mr. Sumlin, who was well-known for playing guitar for Howlin' Wolf, via Notions Capital. Hewlett-Packard to keep webOS alive by making it open source. A potential rival to Android? Via TechCrunch. Harry Morgan, Colonel Potter on TV's M*A*S*H (and appearing on Dragnet, to name another program), dies at 96. Via NPR. Pearl Harbor attacked: A witness remembers, 70 years later. Via Washington Post. FDA approves Blowfish, a hangover pill (caffeine, aspirin, stomachic). Via Washington Post. 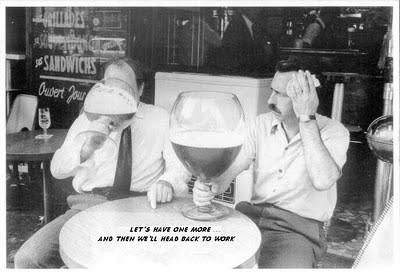 Intoxicating beverages became legal again today in the US in 1933, after 18 'dry' years, with the 21st Amendment. Via CraftBeer.com. New cidery to open in Nelson County, Virginia: Bold Rock Cidery & Brewpub. Twenty-nine breweries in Washington, D.C., Maryland, and Virginia currently post to Twitter. The list, at YFGF.us. Charm City Brewing to open in Baltimore, MD. Collaboration between The Raven Beer and Oliver Ales. Via BeerInBaltimore. Republican candidate for U.S. President, Herman Cain, "suspends" White House bid. Via CBS. "If beer isn't fun, it isn't beer anymore." A clever re-telling of Dickens' "A Christmas Carol," as a cautionary tale for the beer business. Via British blogger The Reluctant Scooper. The British Guild of Beer Writers honor their best. Via Stephen Beaumont. According to one measure, Chrome surpasses Firefox to become second most popular web browser (behind Microsoft's Internet Explorer). Via NPR. 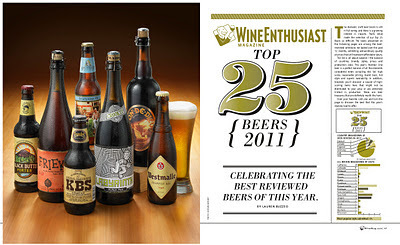 Wine Enthusiast Magazine selects it top 25 Beers of 2011. Analysis by beer blogger The BeerMonger. Video shows secret software on millions of Android phones logging everything, installed by company called Carrier IQ. Via Wired. Study determines "Women Like Men Who Smell of Beer." Via The Sun. Sierra Nevada and New Belgium may setup East Coast breweries near Asheville, North Carolina. Via BeerNews.org. BeerBloggersConference.org counts 810 "citizen" beer blogs in North America, and another 358 throughout the world. Max Planck Institute for the History of Science, in Berlin, publishes online about the origins of Sumerian brewing. Via Brookston Beer Bulletin. 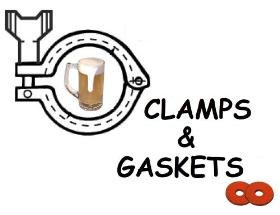 Clamps and Gaskets is a weekly wrap-up of stories not posted at Yours For Good Fermentables.com. Most deal with beer (or wine, or whisky); some do not. But all are brief, and many are re-posts from: twitter.com/cizauskas. Three philosophers walk into a bar. What beer do they order? The eponymous choice from Ommegang, of course, says Stephen D. Hales —Professor of Philosophy at Bloomsburg University in Pennsylvania— in his book, Beer & Philosophy: The Unexamined Beer Isn't Worth Drinking. My brother has an ice cream theory of happiness. For true pleasure, should a person commonly consume daily gobs of low-fat, low flavor ice cream? Or should she instead occasionally go for the fullest-flavor all-the-fat real ice cream and all of its satiating gustatory pleasure? IF YOU HAD $30 to spend on beer, would you be better off spending it on a single case of Pilsner Urquell or two cases of Miller Lite? Ah, that is a question for the ages - to enjoy a little of something that brings you great pleasure, or more of something that is not quite so fine. According to Steven D. Hales ... there's really only one person a beer drinker should turn to for advice on this topic. No, not your bartender. It's John Stuart Mill, the 19th-century British philosopher and formulator of the "greatest happiness" principle. Bringing Mill's stricture down to a mundane level (as if Miller Lite or low-fat ice cream hadn't done that already), the greatest happiness principle could easily be a tool for a personal diet. Eat flavorful things, but in smaller portions. That's the essence of Mireille Guiliano's delightful book French Women Don't Get Fat. She says, "Savor great food and wine [in moderation]". John Stuart Mill, as seanced through Stephen Hales might riposte, "Enjoy great food and beer ... in moderation." 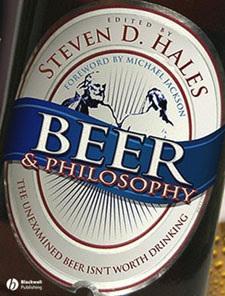 Hales' book Beer & Philosophy: The Unexamined Beer Isn't Worth Drinking is a collection of essays on that and other philosophical topics, as seen, so to speak, through a beer glass. As editor, Hales divides 15 essays by 15 academics, professionals, and brewers among four chapters: The Art of the Beer, The Ethics of Beer, The Metaphysics and Epistemology of Beer, and Beer in the History of Philosophy. Brewers Sam Calagione and Garrett Oliver, among others, contribute to the first more beer-oriented chapter. It's in the essays of last three chapters that the book really entertains, such as the piece by Canadian beer blogger Alan McLeod of A Good Beer Blog. In Beer and Autonomy. McLeod, a lawyer, addresses the Canadian government's limitation and control of alcohol. The contradiction of those actions with the Canadian constitution's declaration of personal liberty could be thought of as a mirror to the United States, where the 21st Amendment codifies a like contradiction. There is a message underlying the taxation of and restrictions on beer movement. It is that the individual in a way doesn't really fully own beer like one owns a hammer or a loaf of bread. <...> One might question the vision the state has of its own citizenry. The law of beer is used to redefine the marketplace, control communication, restrict mobility, and even dispossess the population in its relation to the otherwise commonplace product that is beer. And, to what end? In large part it would appear only to sustain government control and the source of revenue it represents. Neil Manson —an Associate Professor of Philosophy at the University of Mississippi— has written a somewhat whimsical Socratic dialog between three characters wondering if the fact that beer exists might be an indication of Intelligent Design. Whimsical, but enjoyable. Editor Stephen Hales, in addition to writing the book's introduction, contributes a chapter on Immanuel Kant, Transcendental Idealism, and ... Beer Goggles. Is it beer-fueled illusion or reality when that person at the end of the bar becomes more attractive in the wee hours of the morning? "We ordinarily distinguish quite well between that which is ... valid for every human sense in general, and that which ... is valid ... only for a particular situation or organization of this or that sense." What would Fiona conclude when she realizes that Dwayne's added attractiveness comes and goes with beer goggles? ... Yet if you are true to holding that the beer-goggles enhanced attractiveness is a real quality of Dwayne, you might be inclined to argue that Fiona's morning-after realization should instead lead her to a more practical conclusion, such as it's time for another pint of Sam Smith's Oatmeal Stout! Well, who could argue with that? And, of course, there's that chapter on John Stuart Mill and epicurean utilitarianism. Finally (or should that be, initially) the Forward was written by beer author Michael Jackson. It's an essay that could easily have been a literate stream-of-consciousness conversation over beers at a bar. Among the gifts of the Greeks were translations of the Christian gospels from the original Aramaic scrolls. The Greeks interpreted "strong drink" as "wine." I wonder, did they think Jesus turned water into Retsina or Riesling? The Saxons were in no doubt. Their version of the miracle is much more exciting: "Suddenly, the room was filled with barrels of beer." Lest you suspect my own theological agenda, I should make clear that the translation from the Saxon was provided by a Jesuit priest, Ron Murphy, who was at the time Dean of Georgetown University and Head of its Department of Germanic Languages. Ron and I have a pint of Salvator together now and then, but I am sure my certainties have not influenced his verities. Do we have the Greeks to blame for the elevation of wine and the subjugation of beer? It seems to me that they started it, but the Romans followed; Tacitus said that the Germanic peoples drank beer, and that it made their breath smell. I don't suppose he ever rode the Paris metro. Gloriously witty: possibly some of the final words written by this since-deceased writer. Professor Hales inscribed the following on the title page of my edition: "May your beer never go flat." In the spirit of this entertaining book, I might add: figuratively and literally. I've cribbed my review from another —mine— which I posted in December of 2007. The entire list of Cool Yule Beer Books for 2011: here. Beer quintessence: three blokes sampling and talking beer. "If beer isn't fun, it isn't beer anymore." UPDATE: "For capturing ye olde pub in a modern setting, " the photo has been awarded second place in the Yuletide/Christmas Beer Photo Contest of 2011, sponsored by A Good Beer Blog. One of 22 (!) placing second, that is, out of 291 entered. More about the contest: here. Caveat lector: I am employed by Select Wines, Inc. —a wine and beer wholesaler in northern Virginia. The domestic craft beer boom is still in full swing, and there is a growing interest in imports. That’s what made the selection of our Top 25 Beers so difficult. The beers presented on the following pages are among the best- reviewed selections we tasted over the past 12 months, exhibiting extraordinary quality at prices that still represent affordable luxury. The list is all about balance—the balance of countries, brands, styles, prices and production sizes. This year’s Number One beer is a perfect balance of all the elements considered when compiling this list: high score, reasonable pricing, brand buzz, hot style and superb availability. In addition, however, you’ll discover a couple of high- scoring items here that might not be distributed to your area or are extremely limited in production; these are beer treasures that are definitely worth the hunt. After reading the list, I Tweeted about it, and received an intriguing response. Nick Anderson is the beermonger at Arrowine, a wine, beer, cheese, and charcuterie shop in Arlington, Virginia. He's never reticent about his points of view on beer, wine, and life, which he expounds at the shop, and via Twitter and his blog, the BeerMonger.net. I asked Nick what he meant when he wrote that the list was very much a beer list from a wine perspective (other than the obvious, that it was created by Wine Enthusiast). Here is his response, and it's a thoughtful look at what it should mean to be true fan of anything, whether that would be beer or wine. First off, I’d like to thank Tom for having me here. Tom’s been a partner to work with over the years, and I appreciate his opinions and outlook on both beer and wine, so it’s a true honor to be invited. As I work with both beer and wine in my job, I keep an eye on the numerous lists that seem to arrive near the end of every year. Not long after I’d noticed the Wine Enthusiast Top 25 list released, Tom sent a tweet out and it seems we had much the same reaction: We both thought it was very much a beer list from a ‘wine person’. Tom asked me to guest here to explore the list and what it says about what wine pros look for in Craft Beer, and what we might be able to learn from that. A quick note: I use the terms “Wine Snob” and “Beer Geek” pretty liberally. As both, I take ownership of them and actually don’t mean them in any derogatory way. Ok, then. Let’s do this. There’s always been a disconnect; a rivalry between beer and wine. The perception of Beer Geeks and Wine Snobs is one that’s separated us and led to distrust where we should really all be supporting each other. You know; holding hands, skipping through fields of wildflowers and hanging all our clothes to dry on the line outside of our co-op Utopian hippy booze fan conclave. Seriously, though, we have much more in common than we think. It’s just that our preferred beverages lead to some very different desired qualities; those qualities can lead to conflict when we don’t understand them. I myself have this conversation several times per week not only with the mostly wine-oriented customers of Arrowine but with our Wine Department staff and my bosses. Above all else, there is one thing that truly separates Wine and Beer Geeks—Brett. Read through the Enthusiast Top 25: I mean read every one of those reviews and see if anything jumps out at you. This first thing I noticed was that in seven reviews, WEs’ Lauren Buzzeo uses the word “clean” in describing a beer. “Clean” is an obsession with the experienced wine palate; I think most Beer Geeks don’t appreciate just how intensely brettanomyces is derided in wine, and how strong a turn-off any hint of it or anything else construed as not “clean” can be. My boss is hyper-sensitive to brett and it is extremely difficult to find beers that he enjoys. I believe that this is the main reason so many highly polished Wine Snobs with blessed palates choose to drink macro-Lagers, which us Beer Geeks tend to take as an insult to the brews we love and feel deserve respect from our Big Important Establishment Wine Brothers. You can say what you want about BMC and the like, but those beers are consistent and clean. They’re made to be as clean as possible under the idea that “clean” equals “refreshing”. It just so happens that cleanness coincides with the greatest desire of the wine-focused palate. Another factor in the Top 25 that merits exploring is style. Breaking the list down, the most dominants styles are Pale Ale/IPA (8 beers, counting Birra del Borgo’s Extra Re Ale) and Belgian-style Tripel (5 beers). These are styles that lend themselves to brews that refresh, are clean and in their best examples have balance. The key here is to look not just at the style but at which examples of those styles were chosen. #1 beer choice Don de Dieu from Unibroue and #3 Westmalle Tripel both feature creamy textures balanced by spicy yeast and citrusy hop notes, and both are clean. Smuttynose IPA, New Belgium Ranger IPA, and Sierra Nevada’s Pale Ale all get nods from Wine Enthusiast; three beers that most Beer Geeks likely wouldn’t put on their list (hell, I have issues with Smutty’s IPA as a beer in general but that’s from my own experience…) but at their best they are crisp and clean, with a fine balance between hop and malt. Even beers that don’t fit into the IPA, Pale, or Tripel categories reveal something; Harpoon’s UFO White and Baladin’s Isaac are clean Wheat Ales that emphasize balance. Elements in harmony is a must when analyzing wine, and that transfers to the beers Wine Snobs look for—remember, they’re usually going to beer for refreshment rather than one more thing they have to think about. Balance makes for refreshing beer that is easier to kick back and enjoy. That doesn’t mean the Wine Snob’s ideal beer is boring, however. #2 on the list is the outstanding and robustly flavored Founder’s KBS, one of four stouts making the list. Looking further, we find Stone’s Imperial Russian Stout, Ninkasi Tricerahops DIPA, Dogfish Head 90 Minute IPA, Rochefort 10, and Odell Friek among the Top 25. These are all beers that are sought after and respected by Beer Geeks —hell, four of those are among my favorite beers ever. So what are they doing here? You think wine folks are all Snobs with no appreciation for the brewing arts, don’t you? You think everyone with a wine rack in their home is a Wine Snob who couldn’t possibly enjoy intense, robustly flavored beers, don’t you? Well it looks like the Wine Snobs aren’t the only ones pre-judging, eh? The fact is —and I may be saying too much about my wine-drinking brethren here— some of the most well-regarded wines on the planet are big, robust fruit bombs with tons of oak and spice to them. Look at the Wine Spectator Top 100 wines of the year, and you’ll see phrases like “lush fruit”, “hedonistic”, “buttery”, “rich”, “extracted”, and more. The key is to find a wine or beer with intense flavor that isn’t a caricature of itself. Even Sour Ales or beers with brett can be appreciated by Wine Snobs as long as they make sense to them. It all comes back to cleanness, balance and flavor; the way these three factors come together in the glass makes all the difference. For those with a the wine-focused palate, their expectations in a drink don’t change simply because they’re taking a night off from wine to have a couple beers. The criteria used by enthusiasts and pros alike to form opinions on wine carry over to their judgments of the beers they try, and how could they not? Beer fans do the same thing; I can’t begin to count how many times I’ve had friends and beer customers speak of how “boring” some of the most elegant and exquisite wines on the planet are —not simply in the “different strokes, different folks” sense but because there weren’t any of the exaggerated flavors or intensity seen in the typical DIPA, Imperial Stout, or Belgian-style Ale. There is one way, and only one way, to properly approach beer if you’re coming from a wine background and vice versa: Open-mindedness. I use the term Wine Snob with the same love I use the term Beer Geek, but the fact is that there are those out there on both sides who take these things far too seriously. I shy away from the term “expert” and reject out of hand the word “connoisseur”; they imply an opinion that is in some way more “correct” than another (though I can live with “expert” in the right context, I much prefer “professional” as it’s at least accurate). Why you like or don’t like something. That’s it. It’s really that simple. Every wine/beer professional, sommelier, Cicerone, and Master of Wine you’ve ever met has acquired their knowledge because of their interest in the subject. There is no certification or job title that says someone’s opinion is to be the Lord of anyone else’s; rather, when we’re at our best, it’s our job to understand and be able to relate to the palate of whomever we’re speaking to at that moment. I think a bit more of that from all of us, in relation to all of our hobbies and loves, can go a long way toward bridging this gap that doesn’t need to exist between wine and beer folk. The next time you try something that doesn’t float your boat, ask someone who it does work for why they enjoy it. When you hear someone rave about a wine or beer, ask them why they love what they love. The great irony is that the reading of reviews and lists is a pretty blatantly black and white approach for answers in an environment where context is everything. So many people are too easily intimidated by what they think they ‘should’ know, and look to others to tell them what they should like. Too many people think they don’t have the time or the ability to learn about beer or wine: the truth is that everything you need to know is right there in your mouth already. Trust your palate, and never fail to ask a question. You don’t need to know everything about everything; you only need to discover what it is you enjoy, and why. When you do that, you’ll see patterns emerge that will make it easier to discover things on your own. And maybe, just maybe, we’ll all find peace at our bars, if not in our time. Thanks again to Tom for asking me to fill in here. UPDATE: The commentary inspired a lively give-and-take on Facebook. Read that: here. YFGF is always open to a guest post. Contact me to contribute. The full list of the Top 25 Beers of 2011 is available online at the Wine Enthusiast: here. Caveat lector: As a representative for Select Wines, Inc. —a wine and beer wholesaler in northern Virgina— I sell wine and beer to Arrowine ... but not Unibroue Don de Dieu.